This system constitutes a simpler and faster alternative to genome editing technologies such as ZFNs and TALENs. It is based on the bacterial clustered regularly interspaced short palindromic repeats (CRISPR)/Cas9 system which has been adapted to serve as a versatile platform for RNA-directed genome editing in mammalian cells. CRISPR RNAs (crRNAs)- a 20 BPs sequence complementary to the target sequence in the genome. Target cleavage by Cas9 requires base-pairing between the crRNA and tracrRNA (which can also be combined in a single hybrid guide RNA) as well as base pairing between the crRNA and the target DNA. Target recognition is facilitated by the presence of a short sequence called a protospacer-adjacent motif (PAM) that conforms to the sequence NGG, located in the complementary strand of that recognized by crRNA. These two different break repair pathways can be used respectively to generate gene knock-outs or knock-in of defined modifications at the site of cleavage. NHEJ is an error-prone process that frequently results in the formation of small insertions and deletions that disrupt gene function. HDR requires homologous DNA as a template (donor DNA) flanked on either side by sequences bearing homology to the target. The simplicity of using of a Using the CRISPR/Cas9 strategy, retargeting the nuclease complex only requires introduction of a new RNA sequence and there is no need to reengineer the specificity of protein transcription factors. Both CAS9 and guide RNA can be decoded by plasmids or, conversely, CAS 9 can be introduce in the cell as DNA expressed by a vector and guide RNA can be synthesized as an oligonucleotide. 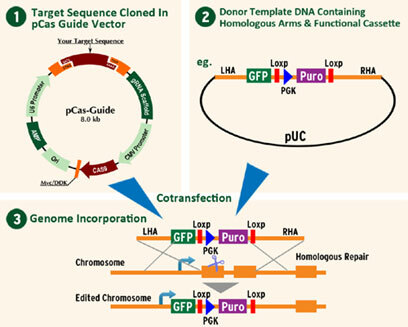 Purified CAS9 protein can be combined with guideRNA to form a ribonucleoprotein complex (RNP) to be delivered to cells for rapid and highly efficient genome editing.